It is well known that light is an important factor within the poultry sector. But we are regularly asked what is the most suitable lighting regime for healthy, productive livestock. Chickens perceive light (colours) in a different way from humans. Humans recognise three colours: red, green and blue. In chickens the eye is one of the most highly developed senses, enabling chickens to perceive more colours. Chickens’ eyes are on the side of the head, giving them a wider field of vision than humans, whose eyes are at the front. In addition, chickens can perceive light outside the eye. They have an eye-like organ immediately beneath the skull which enables them to perceive light and dark. Chickens also have an extra sensitivity peak in the ultraviolet wavelength, which enables them to recognise each other better. This is important for the pecking order because if chickens cannot recognise each other they will peck their companions and this will disrupt the pecking order. 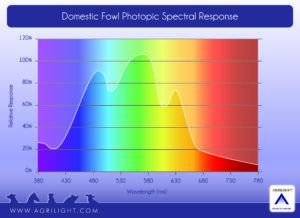 As stated above, chickens are sensitive to light. Good light distribution and a good light level are therefore very important as good light distribution ensures that the chickens are optimally distributed over the full surface area of the house As a result, there are fewer ‘wet areas’ and the likelihood of pododermatitis is significantly reduced. It is essential for the lighting in the house to be dimmable so that it can be controlled as effectively as possible. Dimmable lighting enables you to adjust the lighting to any level required in the house. Good light distribution means a minimum amount of shadow. Chickens do not like being in the dark so it is important to minimise the areas of shadow in the house. 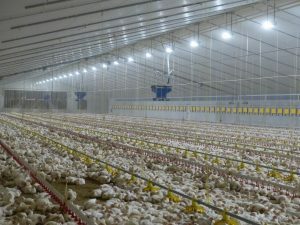 Agrilight b.v. develops lighting that meets the specific needs of poultry. The fixtures are designed to give very good light distribution with a minimum number of lights, without creating shadow. The ideal solution for both farmer and poultry. 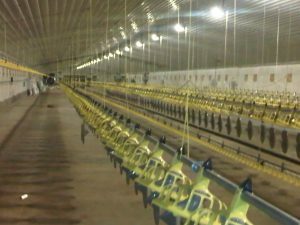 It is important to use high-frequency lighting in poultry housing. 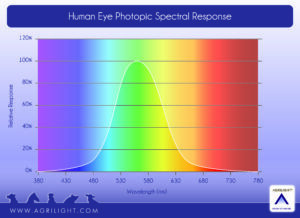 As discussed above, chickens perceive light differently from humans. With lighting at frequencies up to 160 hertz the chicken can perceive flashes of light. Conventional fluorescent lighting has a frequency of 50 hertz. Flashes of light create a ‘disco’ effect in the house – an unpleasant experience for the chickens. The fixtures must also be capable of withstanding the climate inside the house. 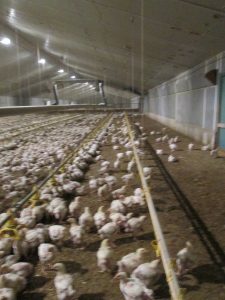 A number of lighting regimes are suitable for poultry. The regime chosen depends on the type of poultry in the house. For broilers, it is a legal requirement to have a minimum light level of 20 lux over 80% of the floor area. The same applies to laying hens, while breeding birds need 40 to 60 lux. Every house is different, so we are happy to provide you with information about the options for lighting in poultry housing.